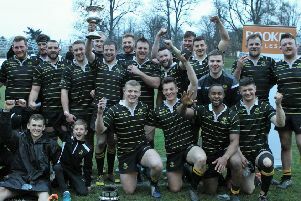 It has been only two months, give or take a day or two, since Selkirk RFC players and their hard working back room team last graced the field of play. But last week boots, tracksuits, clipboards and ties were dusted down once more as the club began its preparation for life in the Premiership. Not that everyone has been enjoying a summer break. For coaches Peter Wright and Cameron Cochrane, building a playing squad worthy of the club’s newly elevated status has been top priority and, as training started this week, several new faces have appeared at Philiphaugh. “We lost quite a few players at the end of last season due to guys returning to where they came from, retirements and folk just moving on,” said Cochrane. “So it was essential that we looked at bringing new guys in straight away. Training for the squad has begun and six new faces have already been introduced, four from outwith Selkirk. Cameron Ring, 21, is a product of Bedford Rugby Academy and will bring some rugby league skills to the park while 24-year-old Dave Allan, from Blairgowrie, is looking to hone his skills at a higher level. Both are utility backs. French front row man Fabian Tetrat, 22, has been sent across the Channel by former Selkirk No 8 Scott Jeffrey after expressing a desire to spread his wings. He will be joined in the pack by back row forward Max Gordon, 22, who comes from slightly closer to home – Kelso to be precise. Making up the incoming sextet are former Youth Club players Fraser Anderson, a flying winger if ever there was one, and prolific points-scoring full back Alan Rutter. Both are making the step up to senior rugby this term and Cochrane hopes that more of their former Youth Club colleagues will follow. “As a club we need to strengthen overall if we are to hold our own amongst the top tier of Scottish club rugby,” he added. “We had 26 players at training last week which is good for this time of year as many are still on holiday or fulfilling other summer commitments.